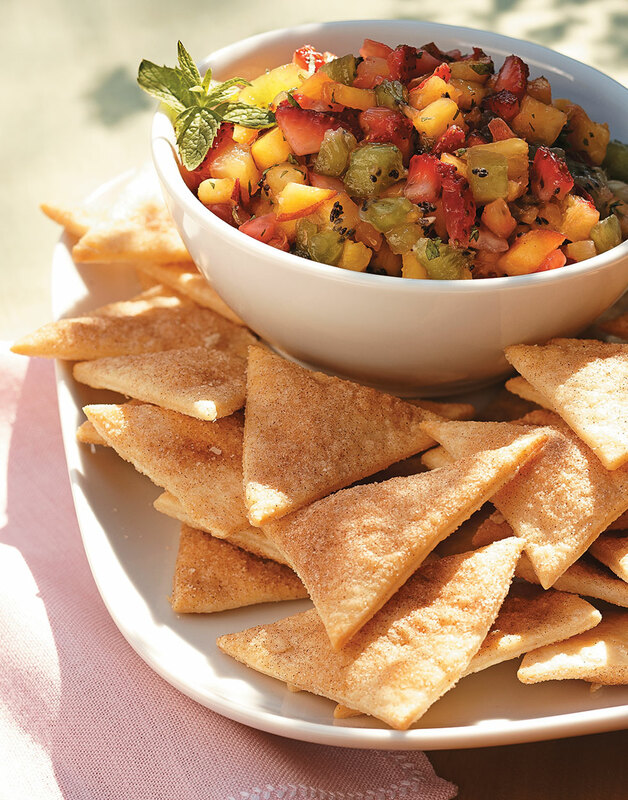 Putting a sweet twist on pita—pie chips paired with fruit salsa is a healthier alternative to your typical sugary dessert with the same great taste. These sweet chips are made from the easily-rolled pie doughs in the refrigerator section of the grocery store, not the preformed frozen pie crusts. Preheat oven according to pie crust package directions; line 2 baking sheets with parchment paper. Stir together sugar and cinnamon in a small bowl; set aside. Unroll pie dough and brush with melted butter. Cut one crust into 8 wedges then cut each wedge into 4 triangles like chips. Repeat with second crust. Transfer chips to prepared baking sheets. Sprinkle chips with cinnamon-sugar mixture, and bake until golden brown, about 8 minutes. Dice all of the fruit and store in separate bowls until ready to serve. Just before serving toss fruits and mint together in a serving bowl. Combine honey and lime juice in a small bowl; pour over fruit. Serve with chips.